Whether you're looking for beautiful views of the Missouri River or to simply find comfort and stillness, we have the right space for your stay. Please note: weekend rates are for Friday/Saturday nights. The Riverview Suite features a king size bed, private bath with shower, Jacuzzi brand tub, electric fireplace (seasonal) and enclosed private porch overlooking the Missouri River. Both the Jacuzzi area and enclosed private porch offer views of the Missouri River and the Missouri State Capitol. Other amenities include free, secured Wi-fi, basic cable television with DVD player and free movie library, bath robes, hair dryer, iron and ironing board. The Riverview also has a hospitality sink and small refrigerator. 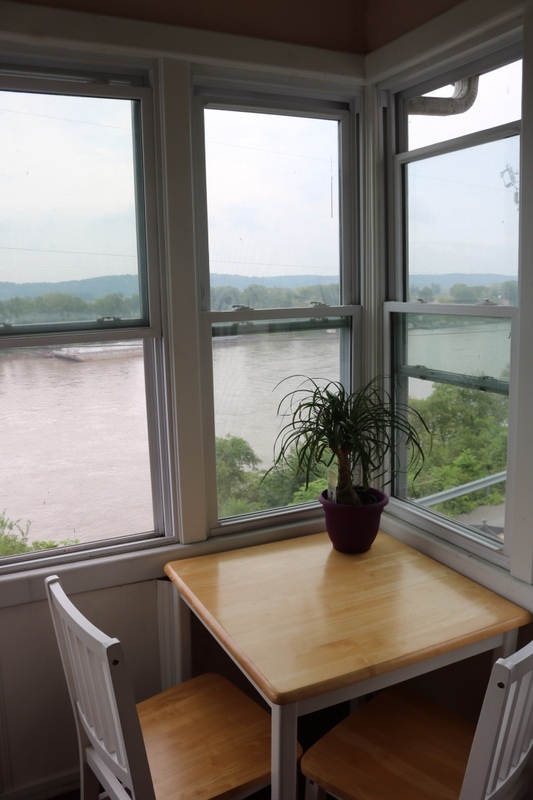 The Riverview Suite is the perfect place to relax, whether you are here for a celebration, for vacation, on business, or if you've been riding the Missouri State Park Katy Trail. Seating for Full Breakfast is traditionally served at 7:30 am or 9:00 am, but chef can be accommodating if you make prior arrangements. Please notify us in advance of any special dietary requirements. Note: a roll-away bed may be available for an extra charge. Call for details. The Bridgeton Suite features a king size bed, full private bath, Jacuzzi brand tub and electric fire place (seasonal). The suite also features a private porch overlooking the Missouri River, as well as a private rear entrance to the suite. Amenities include free, secured Wi-Fi, basic cable television with DVD player and free movie library. Other amenities include a hospitality sink, bathrobes, hair dryer, iron and ironing board. We think you'll find the Bridgeton Suite, with its warm colors and relaxing atmosphere, the perfect place to relax, whether you are here for a celebration, for vacation, on business, or if you've been riding the Missouri State Park Katy Trail. The Taylor Room is one of two rooms with shared bath. It features a queen size bed, free secure Wi-Fi access, basic cable television with DVD player and access to our free movie library. You can also enjoy the view from the home's second story front balcony. Bathrobes and slippers are also provided to make you feel more comfortable going down to the main floor full bath (with hair dryer) and the half bath off the stair landing. An iron and ironing board are provided upon request. The perfect room choice at a very reasonable price! Seating for Full Breakfast is traditionally served at 7:30 am or 9:00 am, but chef can be accommodating if you make prior arrangements. Please notify us in advance of any special dietary requirements. The Krekel Room is one of two rooms with shared bath. It features a queen size bed; free, secure Wi-Fi access, basic cable television with DVD player and access to our free movie library.